In the early ’70s, Japanese cuisine, especially sushi, was foreign to most Vancouverites. Fast forward to 2017: the city has embraced sushi with open arms. It is home to 600 sushi eateries and counting. In fact, Vancouver was the first Canadian city to introduce Japanese cuisine, earning its title as the sushi capital of North America. Judging by the crowds that head to The Lobby Lounge at the Fairmont Pacific Rim, sushi remains as popular as ever. Heading the open-concept kitchen is sushi master Takayuki (Taka) Omi. “Sushi is simply a combination of three or four ingredients, but what makes superior sushi is the ingredients you use,” Taka explains. Japanese born, Taka earned his culinary degree in Tokyo. Before long he was honing his chops working at the Yamaha Resort in Tsumagoi, Japan. In 1997, the talented chef was invited to work at Toronto’s famed Fairmont Royal York. Thirteen years later, drawn by B.C.’s rich seafood bounty, Taka moved west. “Sushi is all about freshness and B.C. is rich with a wonderful selection of fish, like salmon, Albacore tuna, halibut and sablefish. Which as a sushi chef, is a dream,” Taka explains. His enthusiasm for producing “top notch” sushi and introducing unique plates has put The Lobby Lounge among the top-ranked sushi restaurants in Vancouver. 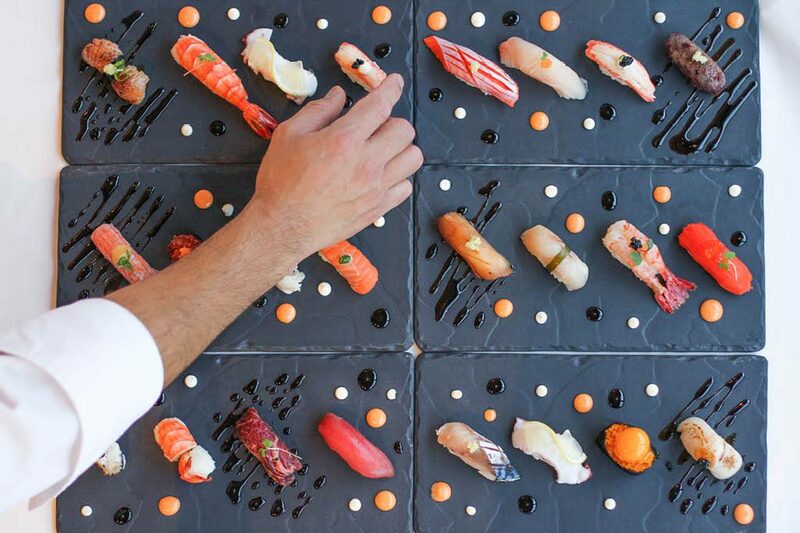 The first 100 per cent Ocean Wise sushi bar in B.C. In 2010, Taka opened The Lobby Lounge and RawBar at the Fairmont Pacific Rim. Before long, his masterfully created sushi consistently ranked among Vancouver’s finest. Then, in 2014, RawBar became the first 100 per cent Ocean Wise sushi bar in the province. “We have a great relationship with local fishermen,” says Taka. “When you purchase the freshest, locally-sourced ingredients and Ocean Wise seafood, you have a recipe for superior sushi.” At RawBar, everything is done in-house – from filleting the fish, to using the fish bones for the Kabayaki sauce, to making the dressings. “That way we can control the quality,” notes the seasoned chef. Adorned in white marble with a grand linear fireplace, and live music nightly, The Lobby Lounge is a dining destination where everybody’s welcome – whether you’re dressed in an Italian three-piece suit or stopping by for lunch with your girlfriends after a walk along the Seawall. Happily, for devotees of authentic Japanese cuisine in Vancouver, there is The Lobby Lounge, where Taka and his team work hard to produce some of the city’s finest sushi.